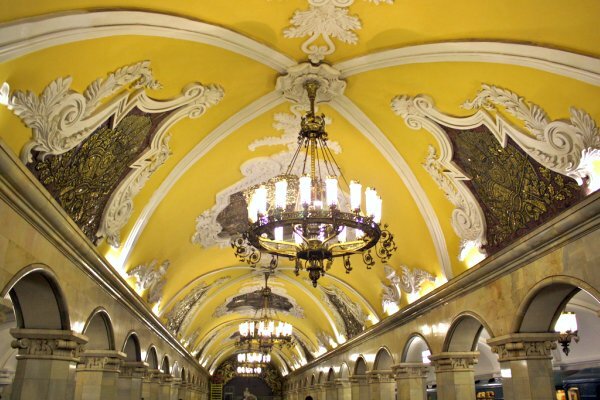 Everyone loves the Moscow subway (Moscow Metro), and there’s a reason for that. It is fast and reliable, its structure is clear-cut, and many of its stations look like palaces or museum halls. Traffic jams are left behind on the surface, trains come every two minutes, and it’s hard to get lost because there are so many direction signs: Just follow the color of your line. This post is prepared by Ruspod, a podcast hub specializing in teaching Russian through audio podcasts, text lessons, and exercises. Visit Ruspod for free and premium podcasts. But what is your line? It’s better to start your acquaintanceship with “метро” with its map (You can find one online or purchase it in a kiosk). You’ll notice that its structure looks like the sun: Lines are like rays that meet in the center and are connected by the ring – that’s Кольцевая линия/the Circle line. Using the Ring line or the central intersections makes it easy to change lines, crossing the city in almost no time. The online map will even build your route for you and calculate the ride time: Just enter your starting station and your destination. To find a subway station, look for the big red letter “M” – it stands for “Метро.” Once in the subway, you have to purchase the ticket (or better a batch, so that you don’t have to stand in the ticket line every time) which you then pass through the ticket barrier. If it is a one-ride ticket, don’t worry if you lose it: You don’t have to pass it through on the way out, and there is no ticket control in the subway itself. After the barrier, go down on an escalator (unfortunately, there are no elevators at all) and board your train. Look for the name of your destination on a sign. It’s as easy as pie – if you can read Cyrillic, that is. Almost no Latin transliteration of signs, very crowded halls, and packed trains in the rush-hour – still, in spite of those drawbacks, the Moscow subway is the best public transportation system of the city.